Over Memorial Day weekend, Mary and I went to Chelan, WA. It’s a wonderful town in central Washington, on the south end of Lake Chelan. It is also – as we found out while booking our accommodations – party central for college students during Memorial Day weekend. Mary’s younger sister and her boyfriend were well aware of this when we told them that we were going. They introduced us to the word “Chelanigans.” I was never clear on whether that word refers to what happens in Chelan over Memorial Day weekend, or the people who go to Chelan looking for a good time. Maybe it’s both. It was not without reservations, then, that we got into the car for the drive to Chelan. Our mood got better as we went, though, for two reasons: we were listening to the audiobook of Stuff Christians Like, which is hilarious, and the weather kept getting better as we headed east. It was cloudy and damp west of the mountains, but cleared up the farther we got over Stevens Pass. On our way through the mountains, we stopped in Leavenworth. 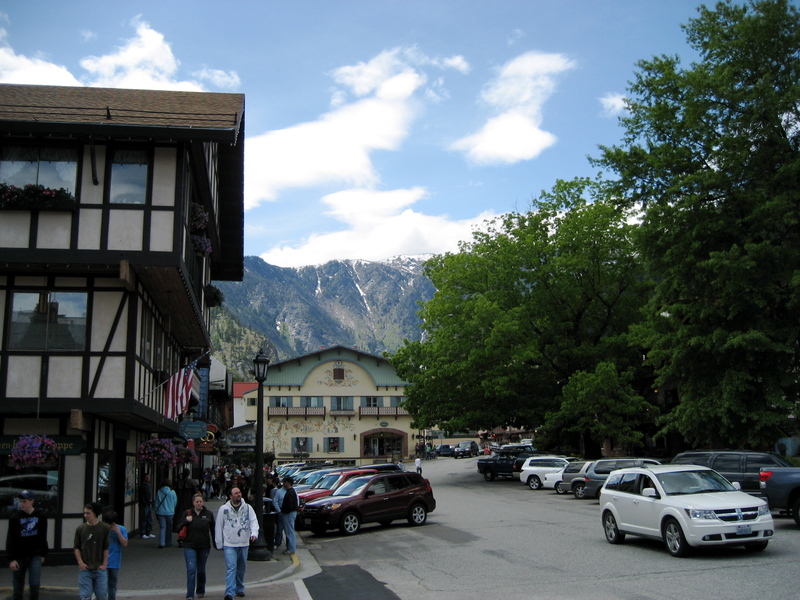 Leavenworth is a small town with a great idea: attract tourists by turning itself into a mock Bavarian village. The whole Bavarian village idea came along well after the town was named “Leavenworth,” but aside from that, the resemblance is uncanny. We enjoyed the nice weather by strolling past the shops, and then stopped for a very German lunch: a schnitzel, a reuben and some beer. We pulled into Chelan later that afternoon, and it was as described: many groups of people in their late teens and early 20s walking around downtown in their swimsuits. I couldn’t help but notice that there was very little mixing of the sexes in the groups we saw (I suppose they had to get a little more alcohol in them to work up the courage for that). There were also a few catcalls, the point of which I’ve never understood. I’ve never understood the point of walking around town in your swimsuit either, even when I was in college. In short, I completely failed to understand how what these college students were doing could be called a good time. Maybe I’m abnormal in that respect. Anyway, the party scene was pretty easy to avoid. After checking in at the B&B, we went to dinner at the Vin du Lac winery, which was full of old fogeys like us. We tasted wine, we listened to some live music, we bought a bottle of Riesling for Mary’s dad for Father’s Day. Then we went back to the B&B, watched part of a movie, and went to sleep. The next morning, we walked to Starbucks and read for a while, then walked back for breakfast. Then we drove to Manson (which is a few miles up the north side of the lake) to have a look around. 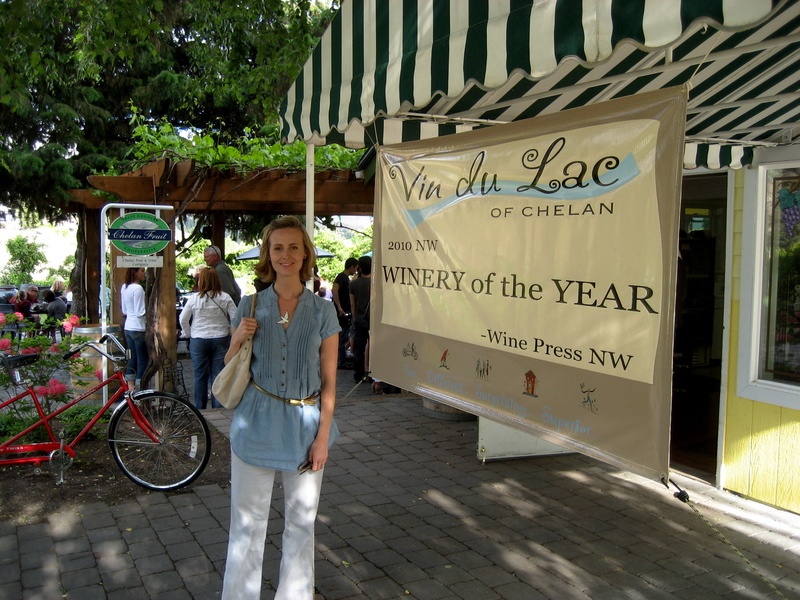 We went to a wine tasting at the Lake Chelan winery and bought some cider. Then we went back to Chelan to have lunch at the Campbell House Restaurant, which we followed up with some ice cream. That evening, we tasted wine and had dinner at Tsillan Cellars. According to its Web site, this is the “crown jewel” of Chelan wine country, so unlike the first two wineries we had to pay a few dollars to do wine tasting here. It was a wonderful experience, though. After breakfast the next morning, we drove back. Turns out a lot of people were headed back west on Highway 2, because traffic was bumper-to-bumper for quite a ways. The weather also steadily worsened as we went west. Bummer. It takes more than that to ruin a good weekend, though. I’m sure we will be back sometime. But probably not Memorial Day weekend.